Transforming Communities for Inclusion Asia Pacific, a regional DPO in the Asia Pacific region, in partnership with IDA, has, since 2014, been advocating for the full and effective inclusion of persons with psychosocial disabilities. Since 2016, TCI has also been involved in global actions, connecting, facilitating and trying to recharge a united global response of persons with psychosocial disabilities through global convenings on different occassions- in Pune at INTAR 2016, Galway 2017, Trieste 2018 and in Geneva 2018. In August 2018, TCI learnt of the upcoming Global Mental Health Summit in London and the “Lancet Commission for Global Mental Health”, set for release in October of the same year. It was considered necessary to have a highly profiled event to critically challenge the globalizing of psychiatry and to bring out an advocacy manifesto on the positioning of persons with psychosocial disabilities from the Asia Pacific region, other than mobilizing voices from around the world. It was in the efforts to reclaim personal narratives and the aim to amplify our voices globally, during the World Mental Heath Week that the Bali Declaration was drawn up. A highly successful Plenary consisting of 3 days of participatory thematic learnings, sharing collective wisdom and drawing up the Declaration, with 21 participating countries from 2 regions – Asia and Pacific – with over 70 participant members including both persons with psychosocial disabilities and their cross disability supporters, was held in August 2018 in Bali, Indonesia. The plenary saw the birth of the “Bali Declaration” which was issued by TCI Asia Pacific. TCI would focus the regional attention concertedly on inclusion, the social model of disabilities, and advocate everywhere the need to reframe the discourse from “mental health” to “inclusion”. One of the key learnings discussed intensively in Bali was that the gateway to psychosocial health through psychiatry most often leads to a dead end whereas the gateway to psychosocial health through disability inclusive development could potentially lead to inclusion. TCI Asia Pacific’s basic challenge to globalizing psychiatry was to have a more universal frame of human rights for interventions and field actions instead of a reductionistic one, focusing on the “right to mental health care” and Sustainable Development Goal 3. 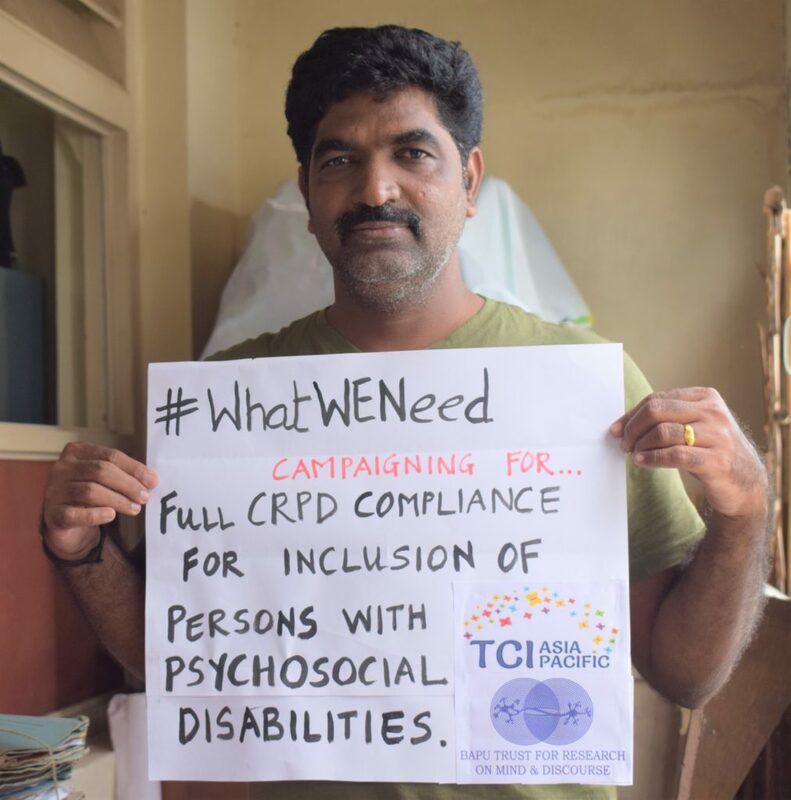 It was thus felt that this message of disability inclusive development and the full and effective participation of persons with psychosocial disabilities must be amplified through another campaign instrument leading to the #WhatWENeed campaign. After some exchanges with potential partners in Africa and Latin America and based on a spontaneous suggestion by Alberto Vasquez from Peru, #WhatWENeed for the Inclusion of Persons with Psychosocial Disabilities was chosen for the campaign and suitable social media identities were created. This was also as a response to the Ministerial GMH Summit’s #TheWorldNeeds. In a way that the cross disability movement was no longer used to and contrary to the spirit of the World Disability Summit held earlier in 2018, the UK Government along with several enabling agencies including the Movement for Global Mental Health (MGMH) planned the “World Mental Health Ministerial Summit” in London. This summit was designed and conducted with no transparency or participation of persons with psychosocial disabilities and users and survivors of psychiatry. Leading activists and organizations including TCI were left out of the proceedings or given a very marginal space to “participate” in working groups. In addition to the Summit, the Lancet paper that was scheduled for release further aroused the ire of the movement of persons with psychosocial disabilities especially in LMIC where such moves are predicted to have the maximum impact. 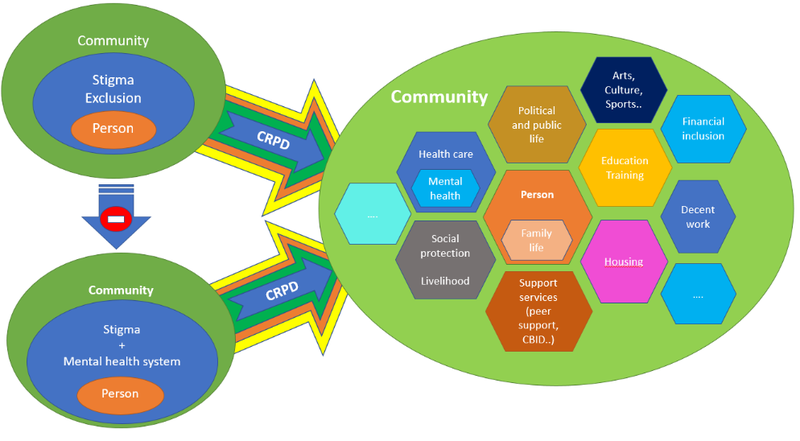 The other developments at this time was the renewed activities of the “Global Mental Health Peer Network”, a virtual network of individuals pressing for a qualifying change within the mental health system without altering the coercion milieu, the rise of United for Global Mental Health also shadowing the MGMH with the slogan “Bridge the Care Gap”, largely using the language of service users around diagnosis, treatment and appeals for overall medical reform. TCI Asia Pacific had hitherto been exchanging and participating more within the disability movement and did not have an instrument for engaging with the mental health systems around the world except tangentially. Considering the gravity of the occasion, TCI decided that the World MH Week 2018 needs to be reclaimed and moments created to address actors within that space. Even though regional, it was considered to be an important occasion to bring persons with psychosocial disabilities/users and survivors of psychiatry, supporters and strategic allies together from around the world. During the WMH Week, the constituency of persons with psychosocial disabilities and their cross disability supporters needed to clearly say what they need and amplify the learning they had had – the western model of psychiatry based on coercion and offering little more than medication had been a failure. The identity differences among regions was covered by a broad definition of persons who could contribute including users and survivors of psychiatry, persons with psychosocial disabilities and those who have self identified as persons with disabilities/persons with mental health problems/or other identities thereof. TCI was also looking at the campaign to provide opportunity for energizing national advocacy in the Asia Pacific regions with full engagement from the emerging TCI Asia Pacific Fellows leaders and their national partners to strengthen their national advocacy efforts by putting out strong messages of Inclusion within Development. While some fierce struggles ensued with groups about who should be included and who should not be, the campaign was clear that any view or practice challenging globalizing psychiatry was welcome. Another debate was whether the campaign was going to be anti-medication. It was eventually resolved that the campaign would challenge the medical model and will always favour full CRPD compliance, while leaving it to different countries and contexts to decide their own positions with respect to psychiatric medication. 1. A Facebook page was created called What WE Need. 2. All tweets/retweets for the campaign were sent from the TCI Asia Pacific account. – Critique of the Global Mental Health Movement and the Global Mental Health Summit 2018 through the collective voices of persons with psychosocial disability worldwide. James Moore of Mad in America supported by helping TCI with videos, podcasts, etc. and by the end of the campaign, a number of useful resources were created. A lead article was published in Mad in America positioning TCI AP against MGMH. Mad in America started a whole project initiative at the time, curated important videos at this time of “an old system wearing new clothes”, including voices from TCI AP. Top critical voices in the critical psychiatry network including Phil Thomas and China Mills wrote for the campaign, the latter also issuing a podcast in Mad in America with ample validation of the works of the TCI AP. The Bali meeting deliberations were composed into bite sized blog pieces, published and tweeted. The Bali Declaration was also translated into many languages (Japanese, Chinese, Sinhalese), and endorsements sought. A new blog space was created wherein several writers contributed on topics challenging GMH. Reframing from mental health to inclusion was the purpose of the blog. Piers Gooding wrote about his report on zero coercion projects around the world. Phil Thomas’ expose on global mental health was posted. Shivani Gupta wrote on the importance of inclusion from a cross disability perspective. Interviews with TCI Asia Pacific Fellows, Janice Cambri and Yeni Rosa Damayanti attracted a lot of interest in cross disability actions on inclusion. Tina Minkowitz, from a traditional user survivor point of view, wrote on the failure of social systems increasing violence against persons with psychosocial disabilities worldwide, demanding a prohibition on coercion. Asia Pacific experiences were described in the blog through reporting from several country partners. Bits of the plenaries from Bali were recreated through posts on the content of the reframing. TCI Asia action in Japan was described giving the cultural context of peer support, especially in high income Asia. TCI action in Myanmar, Nepal and several other countries were also put up. Inputs from different countries – Pakistan, Singapore, Myanmar, Hong Kong, Taiwan were posted on the blog. The blog has been described as rich in content and is quite relevant to upload the voices of persons with psychosocial disabilities worldwide. 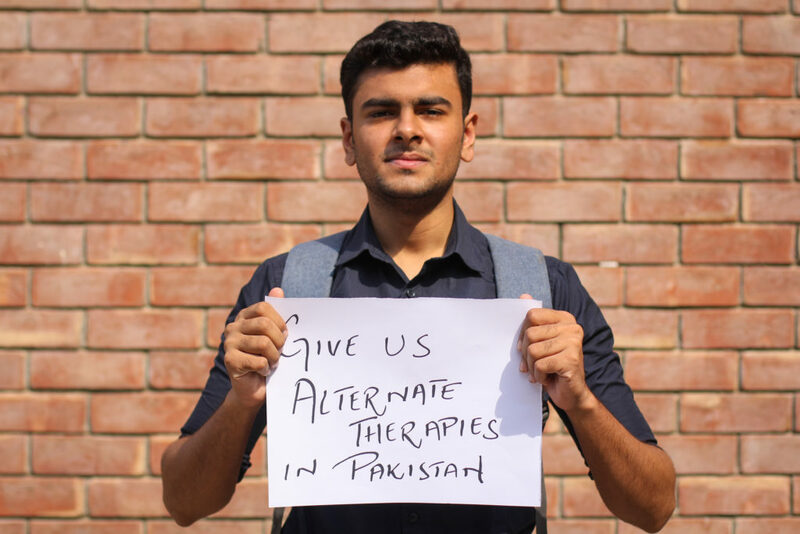 The Pakistan national group of persons with psychosocial disabilities curated a #WhatWENeed video which went viral due to its effective visual presentation. An emerging DPO from Lahore – Psychosocial Disability Alliance made two videos. 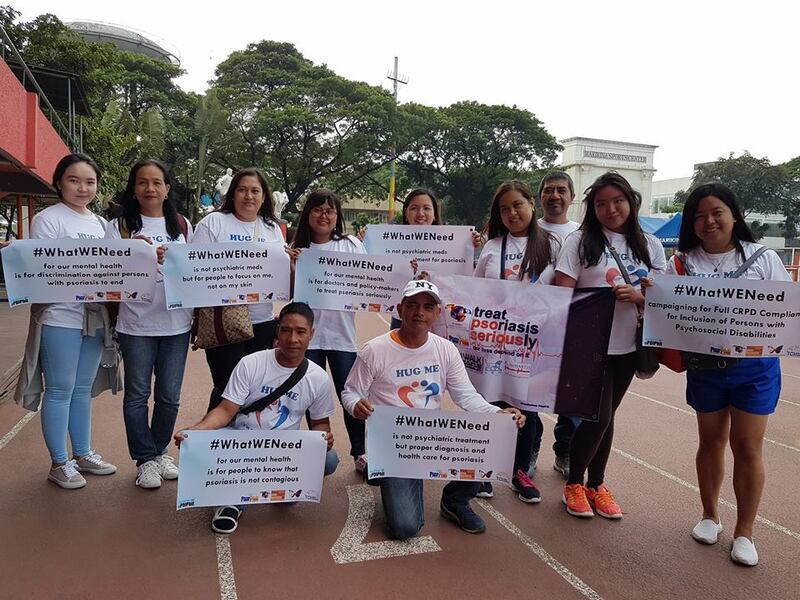 The Malaysia group MIASA, Filipino group Psoriasis Inc. and PDIP led by Josef Guzman and Janice Cambri, the SriLanka group CANMH and Consumer in Action along with IMH Indonesia led by YeniRosa Damayanti all actively conducted awareness programs during the International MH week under the signature of #WhatWENeed. The Bali Declaration was translated into Japanese, Sinhalese and Filipino and a Chinese translation is being worked on. The IMH Indonesia, with good experience in national and regional advocacy did extensive advocacy awareness meetings in Jakarta engaged with the government, and put out public messaging on #WhatWENeed focusing on voting rights, right to liberty, relief from social care institutions, right to housing, employment, social protection and right to work. Several departments were targeted for the advocacy and it was not limited to only the health department. Importantly in this time, new advocacy groups of persons with psychosocial disabilities were formed adding to the numbers of national DPOs facilitated and enabled by TCI Asia Pacific. Engagement with governments, public engagements, planning, dialogue and implementation of key advocacy messages on CRPD compliance, Article 19 were highlights and accents of the campaign and the Bali Declaration was a key reference text for the campaign. National advocacy for TCI AP strengthened greatly with the 3 month intensive actions, and ensuing exchange and co-operations among TCI partners. The #WhatWENeed campaign will be run every year during the World Mental Health Week as a global platform to give voice to persons with an identity of psychosocial disability or from the cross disability sector and to continually work on challenging globalizing psychiatry and it’s effects and partners. The campaign will continue to focus on bringing about inclusion in development and the full compliance of the CRPD.